Or as some may call it, plain Dumb Luck. I had spent the last few days getting the boat ready to depart for the roughly 200 mile trip back to Miami. But in reality, there was little to get ready, so I spent the last days riding the little Nassau buses around and just observing life. In these last days, I ended up totally changing my views on the people and the Bahamas. It’s hard to explain why I started with such feelings of trepidation, it’s not like I am unaccustomed to foreign places and cultures, but in any case, I left with the genuine fondness for the life and the people. I found the people warm, generous and very honest. 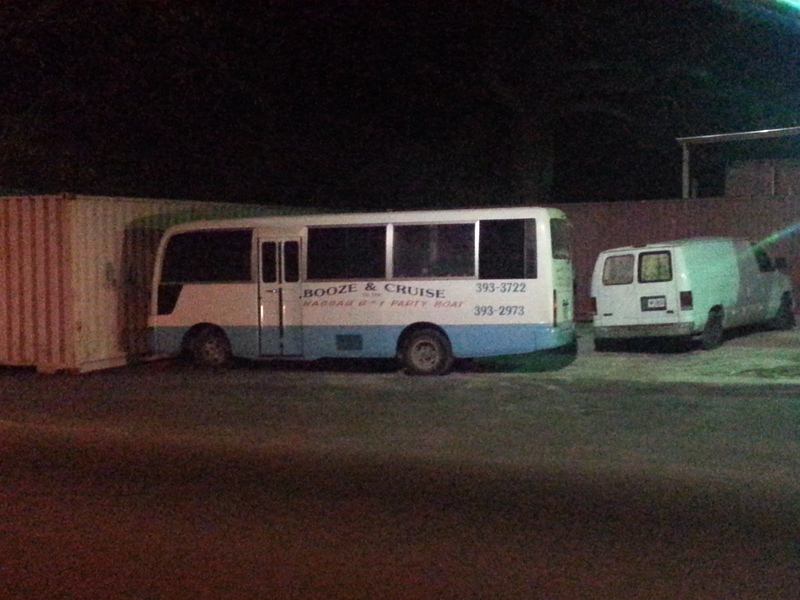 There is a respect that pervades Bahamian society and it manifests itself in many ways. The buses are small (for a NYer) 25 seat buses that zip around on assigned routes, but not assigned stops. Therefore you can flag your bus down anywhere along their route and get off the same way. One pays as they get off. Everyone sits down and when the bus is full, a little third seat folds down into the aisle. More than half the riders give a salutation as they get on, usually “good afternoon” to the bus in general. The seats are relatively small, as I was struck on one tall, lanky man got on with a big backpack and instead of plunking it down on a vacant seat next to him, he proceeded to squeeze himself into the seat with backpack on, and then proceed to do this Houdini thing, where he switches it around from his back to his lap. Unlike NY, people don’t sprawl all over like it’s their living room. It was that incident which made me observe better and the realization came as to how respectful everyone is, young and old, to others. No one plays music or really disturbs their fellow passengers in any way. Now as to the music, about half the buses do have some type of music blaring. I never did figure out how the driver could here as a passenger would call out, “bus stop”. But they always did. Also the music, some combination of reggae and rap, on Sunday, became gospel music, on all the buses! A few buses had church radio stations on during the week also. I was struck my how efficient they system was, reminded me of Seoul, Korea, in that it consisted of a lot of busses, traveling as quickly as they can, as often as they can. The exact opposite of what the NYC transit system has become, in which the buses in particular, are run on a schedule that guarantees that while they may be on time, it’s only because they are so slow and too large. They take forever to load and then crawl along slower than a walking pace. A system clearly designed by someone who never takes the bus. 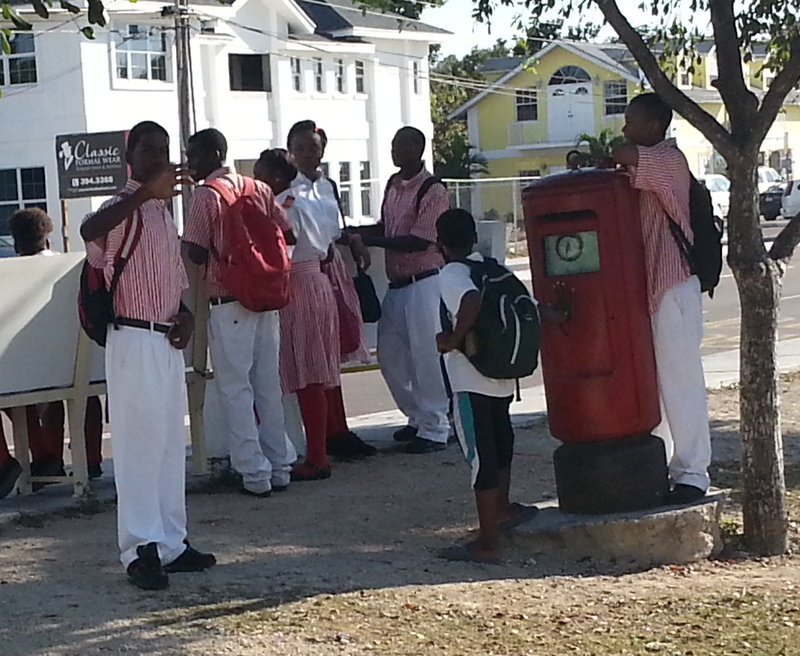 All school kids wear uniforms and while each school had a distinctive look, there was no variety within a school. Many high school level schools had a uniform that was opposite for boys and girls, meaning, girls would have a red skirt and while shirt, while the boys in the same school would have white pants and a red shirt. Coming back to the marina for the last time, as I said goodbye to those who had watched over Dauntless in my absence, I was saddened to say goodbye. They were generous with their time and efforts. They adjusted my lines as need be and made sure the boat always had electricity. Couldn’t ask for a better stay or experience. I am alone now. 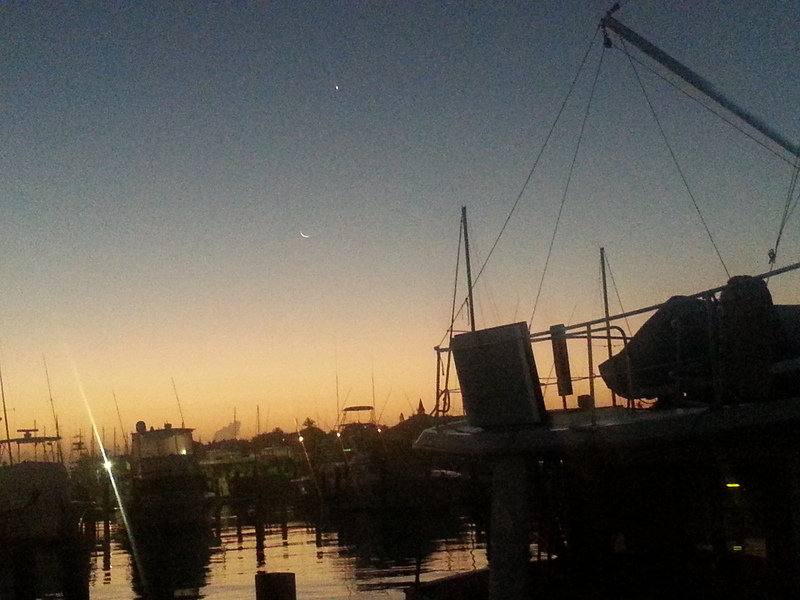 I departed Florida two months ago with a crew mate, Chantal, who turned out to be really great. A good learner and she tolerated my idiosyncracies, what else can one ask for. I had trouble sleeping I was so excited about leaving. There is something that is so magical for me in the early morning hours being underway. We even thought about naming the boat Dawn Patrol, but thought it was a bit corny, though it did appeal to my patriotic (for lack of a better word) side, to show an appreciation and thanks to those who have the usually thankless job of watching over the rest of us (military, fire & police, etc.) while we are fat, dumb and happy all cozy in bed. This was going to be the third time I left this marina, so I felt I should nail it (back in the day of BMW’s vs Alfa’s, third time around the track was usually my fastest time, as I kept on trying different ways to better my time). So I went to bed thinking of the lines I would use as I was single handed. I was starting the engine just at high tide, so I knew I had almost an hour before the current really started going, as I had to back into it. I knew I needed to get away before it really started running its 2-3 knots. So, all is going as planned (I also wanted to run the engine 20 minutes, even though I had run it yesterday, 15 minutes is the time it takes to manifest any fuel issues). As soon as I took off the stern port side line, the boat snugged up to the pier, easier for me to get on and off, and I have rub rails and am not afraid to use them. The boat did move forward a bit, so I retied the Stbd stern line tight to the piling, so the boat would not move forward. The spring lines came off and two port lines, I then retied the one bow starboard line with a loop over the piling, with its eye over my forward cleat, and me taking the bitter end to near the pilot house door. This would be the last line I would release and as the boat moved backwards, the line would slip around and off the forward piling, while still connected to the bow cleat. Worked like a charm, for the most part; I ran to the stern, undid the line and pulled it quickly into the boat (no lines outside). Quickly stepping back to the pilot house, putting it in reverse as I heard the bow lightly kiss the slip goodbye, cute I thought, as I released the bitter end of the line that was looped around the piling. 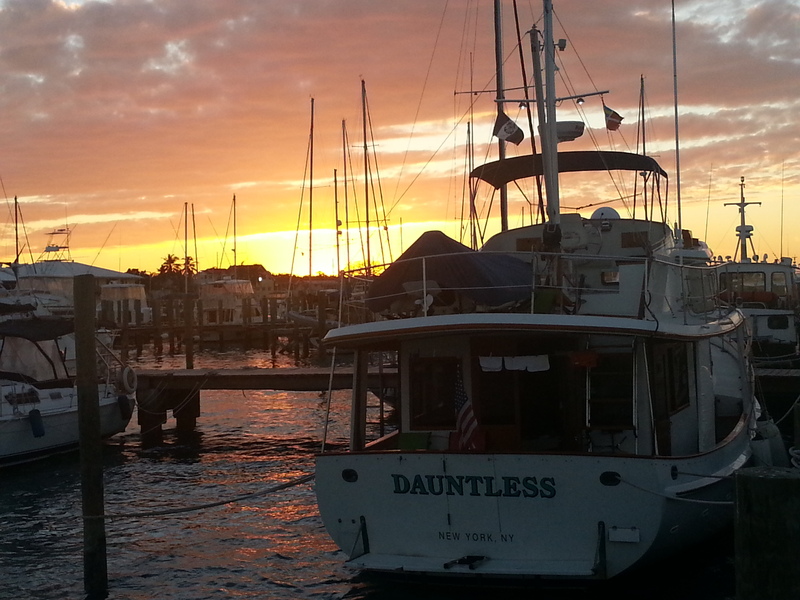 As Dauntless boat backed out, we wwere free, perfectly I thought. Had to make a quick left, parallel to the slip I had been in, to stay in channel, then a sharp right in about 200’ between some ferry and the marker. All is going well, I’m in the Nassau channel passing under those two bridges to Atlantis. Did you catch what I left out? Yes, my bow line was happily streaming under the boat, but in what I’d like to call “unconscious foresight”, though many of you will probably say is simply dumb luck, I had used a short bow line, only 25’. I immediately ran out and pulled the line it, thinking what disaster it could have been had I used one of my normal 50’ lines. I’ll give myself some credit, as I did use the shorter line, conscious of the time it takes to pull it in. Sitting here now in Chubb Cay, with good holding in 6’ of water, with 80 ‘of chain out. The winds are constant SE at 15 knots, but there is a southerly swell, so I am rocking and rolling a bit, but if this boat didn’t roll, I would think we were aground. Tomorrow it’s Cat Cay and then crossing the Stream. Really like this blog. It’s great to hear your experiences with the people & the country!